Fan Bingbing (范冰冰) was recently witnessed at a fine dining restaurant, rumored to be seeking help in raising funds to help pay for her 883 million yuan tax fine. Her recent embroilment in tax fraud has led to serious repercussions. 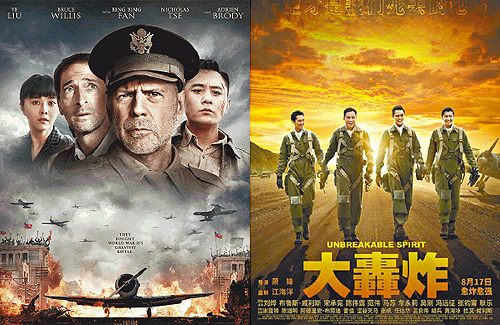 It was announced today that her new movie, Air Strike, also known as Unbreakable Spirit <大轟炸>, is shelved and its theatrical release cancelled in China. This was a costly movie with a budget of 700 million yuan. Its international cast includes: Bruce Willis, Adrien Brody, Liu Ye (劉燁), Nicholas Tse (謝霆鋒), William Chan (陳偉霆), and Song Seung-Heon. When the news of Fan Bingbing’s tax evasion broke out, the producers had tried to salvage the situation by deleting all of her scenes and removing her name from posters, but to no avail given the uproar over the situation. The former producer of this film is actually Cui Yongyuan (崔永元), who had exposed Fan Bingbing’s use of yin yang contracts. He called for the boycott of this film, sarcastically stating that the film should be called the “Big Scam” instead. Declaring that this movie had squandered millions of hard earned dollars from Shanghainese taxpayers, he questioned how the movie had even received approval to be filmed. His statements have led to netizen speculation that the film may have been a front for money laundering. Although Mainland Chinese viewers won’t be able to find Air Strike in local theaters, the film will be released in North America on October 26, 2018 without any deletion of Fan Bingbing’s scenes. This article was modified on October 18, 2018 to reflect that Air Strike has only cancelled its screenings in China, but will be theatrically released in North America. So why not use the box office profits to pay back the taxpayers’ money instead? I wonder how will boycotting this film help the situation. @jimmyszeto I was not referring to FBB. Who are you referring to then? It’s FBB that owes the tax….Shall we all contribute and help her pay some off as well? I think this cancellation was related to Cui Yong Yuan announcement that ECID Shanghai police received bribe money for this movie. But take it with grain salt. Doing business in China is not easy.